Bathroom Complete - Bathrooms, Tiler - Tiling based in Kings Worthy, Hampshire. I have been self-employed for over 30 years and I really enjoy the work I do, I have been told cleanliness and neatness are praiseworthy and these are characteristics I work to. 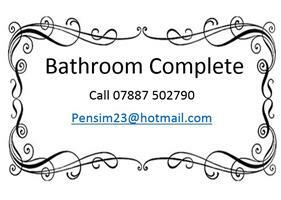 Please let me know what your requirements are and I will ensure I create your dream bathroom. I can supply all necessary materials if required.